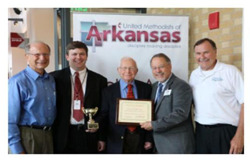 The National Association of Conference Presidents of the United Methodist Men awarded Christ of the Hills United Methodist Men the honor of Top UMM Unit in the Nation on Tuesday, June 16, 2016 at the Arkansas Annual Conference of the United Methodist Church which was held in Hot Springs. Gil Hanke, top staff executive of the General Commission on UM Men, presented the wall plaque and trophy to Fred Gore, 2015 UMM President during the Annual Conference. Over 30 members from Christ of the Hills were also present to show their appreciation to the Methodist Men..
A committee of conference and jurisdictional UM Men officers selected the top five local church units, the top district unit, the top annual conference unit and the top national unit. “Our focus is to support our church mission to “Bring In, Build Up and Reach Out”, said Bubba Smith, Sr. Pastor at Christ of the Hills. Men of Christ of the Hills UMC conduct an annual retreat, sponsor a sweetheart breakfast for wives, and annually raise $14,000 for various mission efforts. Funds are raised by an annual golf tournament, a church barbeque, recycling aluminum cans and printer cartridges and assisting the United Methodist Women with their super-sized garage sale. The men provide food baskets and deliver gifts to 40 families including 100 children at Christmas. They also deliver food baskets provided by other groups in their church at Easter and Thanksgiving and volunteer every month at two local food banks. This energetic group annually works with the Oaklawn Race Track Chapel to provide support to the approximately one thousand “backside” race track workers and their families. A barbeque meal is served to 400 plus workers and meals; gifts and warm clothing are provided at Christmas for the families. They also support the collective ministry of several churches to serve Sunday lunches to the homeless and people in need. 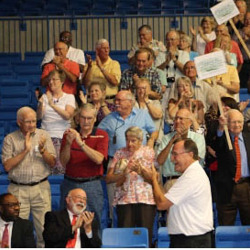 Thirty-five members of the group have attended the “Walk to Emmaus” and in 2014, Christ of the Hills UMC UM Men contributed over 6,000 volunteer hours.